The Oak Tree seat was erected in 2001, a piece of an old railway sleeper balanced on columns of old bricks. 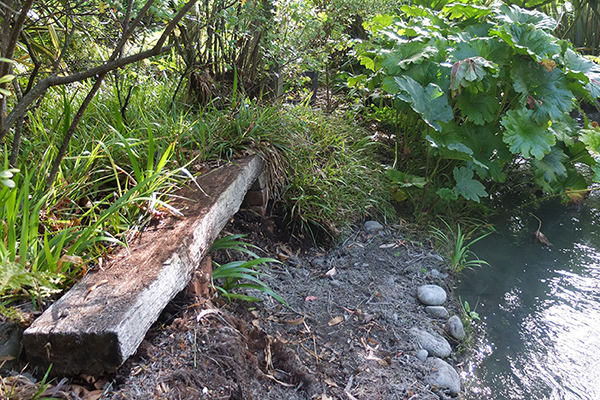 It was first situated underneath the big Oak trees, just where the path dipped down to the water's edge. It was the same style as several of my other seats of the time. There were masses of New Zealand native plantings behind, and on the opposite side of the path were two Scarlet Oaks under-planted with bluebells and blue aquilegias. 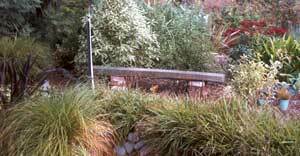 A variegated carex was planted underneath, at the foot of one brick column, and variegated Pittosporums formed a screen to one side. Seats with this easy construction are very mobile. Almost immediately I moved it closer to the water's edge, so I could sit dreamily watching the water flow by. 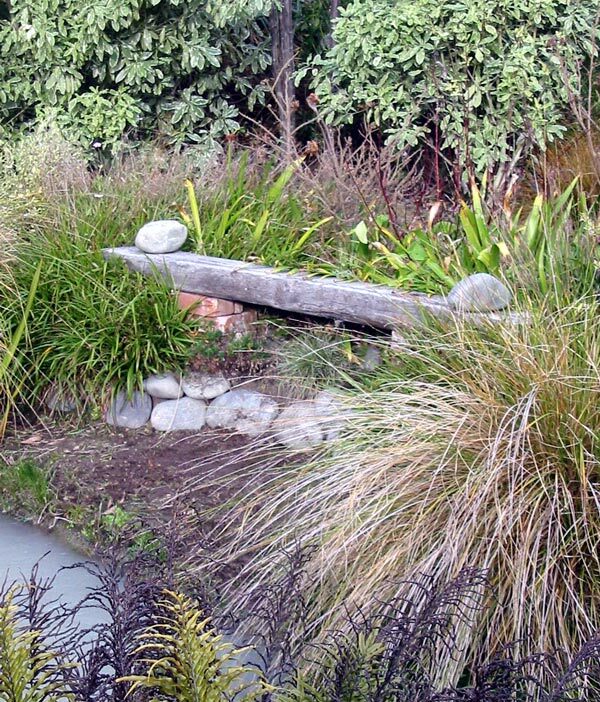 The whole wooden seat, complete with stones artistically placed, was then surrounded by a grass-like plant, name unknown. I remember I'd pulled a little clump out of the local Botanic Gardens. Oops. I then planted three Roseriae de l'Hay rugosa roses nearby, and a large Fruhlingsmorgen, leaning towards one of the oaks. I planted daffodils and pansies by the path's edge near the Oak trees, and Phormiums (and another rugosa, the lovely lemon Agnes) in the spaces. Duck Lawn (where spring duck families spend a lot of time resting) was visible through the roses. But the nicest thing about this seat was the gentle sound of the running water. When I used to take Jerome the cat for walks around the garden she just knew we'd stop and sit here - she'd jump up first and miaow for me to stop. 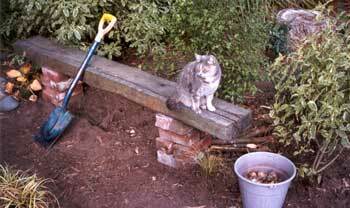 This was her favourite garden seat. And it soon became one of my favourite places to sit, relax and listen to the watery words and syllables coming from the water race - especially in the late afternoon sun. In my garden, things grow more than I expect them to. So the inevitable happened. Access became more and more blocked off by shrub growth. Then that little grass-like plant spread, and bulked out, and covered everything in sight, including the wooden seat top. The roses spread themselves out and I didn't want to prune them back. Same old story. The Oak Tree Seat has been there ever since, buried underneath foliage and greenery. But look at the above picture, taken in the autumn of 2017. Ha! I'm trying to restore it to its former glory.